Congress president Rahul Gandhi will launch the party's election campaign on Saturday in Rajasthan, which is expected to go for polls later this year. As per his schedule, Rahul will land in Jaipur at 1:30 pm and will later address a public gathering at Ramlila Maidan in the evening, thereby officially kickstarting Congress' election campaign in the state. "In preparation for the upcoming state elections in Rajasthan, I will be in Jaipur today, to meet with citizens, Congress party workers and leaders and to address a public meeting at Ramleela Maidan at 4.30 pm," Rahul tweeted. 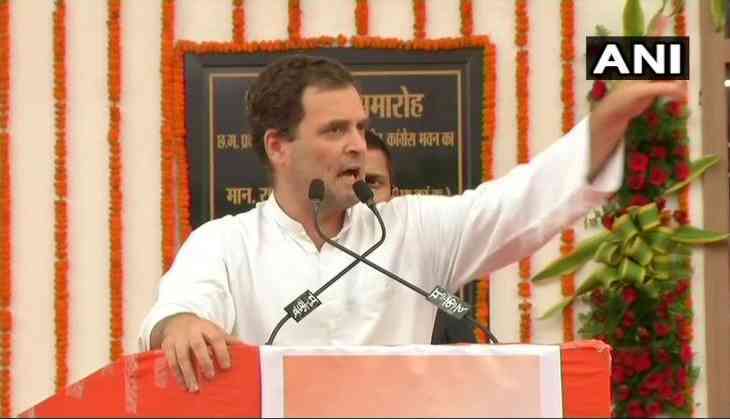 On Friday, the Congress president held a rally in Raipur, Chhattisgarh where he questioned Prime Minister Narendra Modi on his silence over the incidents of alleged rapes in the Bharatiya Janata Party (BJP)-ruled Uttar Pradesh and Bihar. "The Prime Minister does not utter a word when girls are raped in Uttar Pradesh and Bihar. Now, even women across the country have begun to wonder why the Prime Minister is not speaking on the issue," Rahul said. Touching upon the issue of women's safety, especially in the BJP-ruled states, the Gandhi scion expressed concern over alarming rise in atrocities against them. Gandhi even termed the Rafale deal as the country's "biggest ever" scam and accused Prime Minister Modi of being involved in the same. "I asked the Defence Minister in Parliament why she lied to the people about the fighter jet deal? But my question was not answered. When I asked the Prime Minister, he was not able to look into my eyes. He started looking here and there because even 'chowkidar' was involved in this scam," he said.